Most may know about the remedies for Apple Cider Vinegar. You can use ACV for so many things but I’m going to tell you just a few health benefits. 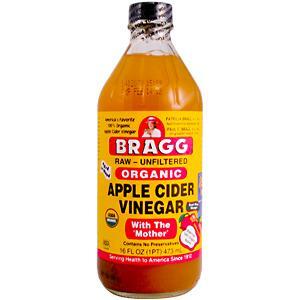 I use Bragg’s Organic Raw Unfiltered Apple Cider Vinegar. I’m sure they have many other brands but Bragss has been around a long time and I like the unfiltered version. You can drink this 3 times a day. First thing in the morning, Mid-morning and Afternoon just 1 or 2 tablespoons each. It has anti-viral and anti- bacterial properties. This really works but the smell is awful! You can drink it straight or add 2 tablespoons to your 6-8oz water. Posted by painb4gain on June 3, 2013 in Tips and tagged Apple Cider Vinegar, Weight loss.